Your storage array needs to be configured based on what VMware recommends/supports. The steps below will go through the process of validating that your storage array Multipathing MEM (MPM) is configured according to VMware’s recommendations. 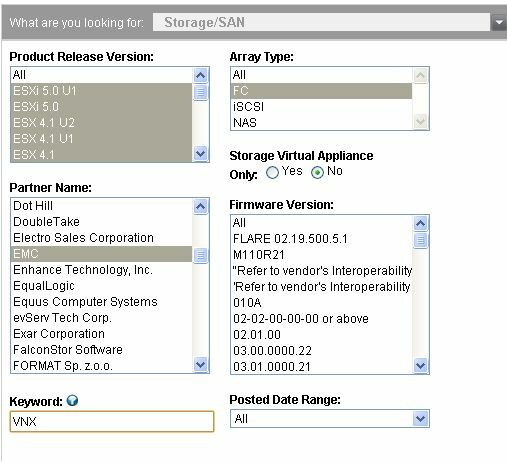 By default, the “Storage Array Type” shown above is automatically pulled down from the SAN when you scan for datastores. Notice that the “SATP Plugin” column recommends a different SATP configuration than what we have shown above (VMW_SATP_CX vs. VMW_SATP_ALUA_CX). To fix this, you need to reconfigure the storage array to go from Failover Level 1 to Failover Level 4 (ALUA). This can vary depending on which array type you have. The process outlined above can be followed for basically any storage array that is connected to VMware hosts. I highly recommend looking through VMware’s Compatibility Guide and configuring your storage according to their recommendations. This entry was posted on April 1, 2012, 12:17 pm and is filed under VMware. You can follow any responses to this entry through RSS 2.0. You can leave a response, or trackback from your own site.